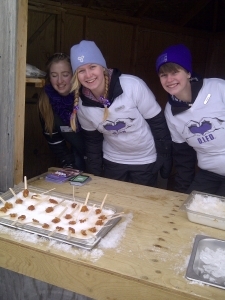 It wouldn’t be a trip to the sugarbush with out a visit to our Taffy Shack! Made right before your eyes, from 100% pure Stanley’s Olde Maple LaneTM Maple syrup, Taffy on the snow is a Spring time Canadian Tradition. Buy your tickets at the Stonehouse Gift Shoppe or pay by cash on site. Bet you can’t have just one! Can I bring some Maple Taffy home with me? This is a question we get asked all the time! Maple Taffy is best when made fresh from real Maple Syrup. To be able to package it and send it home, we would need to add preservatives or other ingredients such as corn syrup, and that would alter the flavour & texture. This is why we don’t sell our Maple Taffy in tubs. Available in our Gift Shoppe – We have found a commercial taffy product that is pretty tasty. It is available in little glass jars and comes complete with teeny wooden spoon to help you gobble it up. This is not a product that is made by us, so it’s not made from Stanley’s syrup.